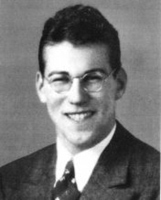 Benjamin Salomon was drafted into the U.S. Army in 1940. A dentist by trade, by 1944 he had been promoted to Captain serving as regimental dental officer for the 2nd Battalion, 105th Infantry Regiment, 27th Infantry Division. After the 2nd Battalion's surgeon was wounded, Salomon volunteered to replace him. On July 7, 1944 the 2nd Battalion was fighting the Japanese at Saipan on the Marianas Islands. There were high U.S. casualties. Salomon ordered his colleagues to evacuate the wounded soldiers while he went out alone and fought off the Japanese with a rifle taken from one of the wounded soldiers. By commandeering a machine gun, which had two dead soldiers on top of it, he managed to kill 98 Japanese soldiers. After being shot 24 times he finally fell dead and was found slumped over his machine gun. He was first recommended for the Medal of Honor by Capt. Edmund G. Love, the 27th Division historian, but it was denied because as medical personnel he was considered ineligible. It wasn't until May 1, 2002, and numerous attempts during the half-century following the war, that he was finally awarded with the honor. After Salomon had fallen dead he was shot over 50 times. His Medal of Honor is on display at the USC Dental College where he had graduated in 1937. Sometimes known as the Congressional Medal of Honor, it's the highest military honor given by the U.S. Government. Meyer, Daniel. "Ben L. Salomon - Jewish Medal of Honor Recipient." J-Grit: The Internet Index of Tough Jews. J-Grit.com. Apr. 2019 <http://www.j-grit.com>.